Black Friday is fast approaching, and if you’re looking to score an Apple product on the cheap later this week, then this is one of the few opportunities that you’ll have until the same time next year. A number of great products will be discounted, and with the Cupertino company having also announced a partnering effort with (PRODUCT)RED, users may be able to score themselves a special gift card with qualifying products. (PRODUCT)RED has long since forged close ties with major brands, and given that U2 frontman Bono is at the heart of everything, it should come as little surprise that Apple is once again involved with this laudable cause. 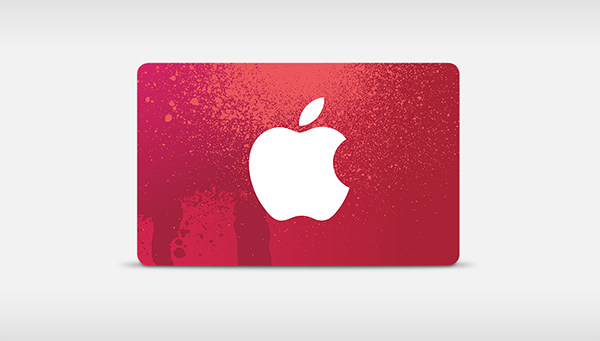 Anybody snapping up an iPhone this Friday – from last year’s iPhone 5c and 5s models to the all-new iPhone 6 and iPhone 6 Plus – will receive a $50 gift card, while those picking up an iPod touch or iPod nano will be offered a $25 (PRODUCT)RED gift card. Not only do the gift cards add a little spice and incentive to what is shaping up to be a manic weekend for tech fans, but the fact that Apple has made ties with a charitable cause is definitely a good thing. 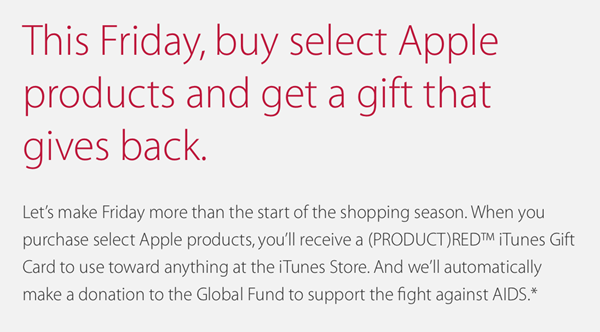 Away from the iOS device range, those buying a Mac this Friday will see a $100 gift card, although this offer doesn’t factor in the Mac Pro, which was launched late last year. The trashcan-shaped machine, which offers a massive overhaul on the preceding form factor, is one of the few that will not be eligible for the (PRODUCT)RED voucher, although given its high price to begin with, any gift card would unlikely play a role in determining whether you buy or not. Elsewhere, Apple TV, which only costs $99 at full price, will yield a $25 gift card, as will the numerous products of Beats Electronics. Having been acquired by Apple only a few months back, Beats has quickly been integrated into the Mac maker’s business structure, and if you wish to snag a pair of headphones or speakers this Black Friday, you might like to check out what’s happening at your local Apple Store. The Global Fund will receive a donation of each purchase made, although precisely how large percentage this will be remains unknown. We’ll keep you posted on any further Black Friday discounts and offers, so stay tuned! I thought Black Friday is all about discount? I see no discount there…. Nah, I will ignored it. No discount, no buy. Thanks. Trying to sell fail product with gifts? Creative much? Discount and Apple? Never heard about it! Thinking of being smart I thought were the prerogative of the Italians but now I realize that even the Apple not joking. Give us back Steve Jobs.